Is This a Drug Deal or a Rights Offering? (Bloomberg Opinion) -- What happens when strategic ambition meets financial constraint? The answer is found in AstraZeneca Plc’s $6.9 billion oncology tie-up with Japan’s Daiichi Sankyo Co. Ltd. The U.K. drugmaker is resorting to costly financing to get the deal done. Shareholders will not only have to take the potential upside on trust, they will have to share it. The partnership is AstraZeneca’s biggest in more than a decade. A couple of years ago, the drugmaker was linked to a possible takeover of Daiichi, a deal that would have been a stretch even then. It is possible that AstraZeneca would have preferred an outright purchase of the breast cancer treatment at the center of the agreement announced Friday – but that was probably beyond reach, too. AstraZeneca will sell $3.5 billion of new shares to fund the collaboration deal. The response, a 6.5 percent drop in AstraZeneca’s stock price – representing about 5.4 billion pounds ($7 billion) of market value – looks to be more than a case of indigestion as the market is force-fed some unexpected new stock. In essence, Daiichi is selling a stake in the drug’s future. Vendors generally have better information than buyers, and it would be surprising if the Japanese group was on the worse side of the deal. Tellingly, Daiichi’s market value increased by $4.5 billion on Friday. It’s hard to know precisely what the returns for AstraZeneca will be at this stage. What is clear is that the large equity financing is expensive – and far in excess of the immediate payments required under the deal. AstraZeneca can borrow at less than 2 percent, while its cost of equity is estimated at more than 10 percent. The transaction is nevertheless wisely structured: an initial $1.4 billion is split between two payments a year apart. A further $3.8 billion is linked to passing regulatory milestones and another $1.8 billion is tied to hitting sales targets. That cuts the risk for AstraZeneca shareholders. But why then raise so much equity? Superficially, AstraZeneca’s leverage looks tolerable at twice reported Ebitda. But this belies a tight financial situation, as UBS analysts note. The dividend is scarcely affordable and the company faces regular refinancing obligations over the coming six years. The company needs all the flexibility it can muster. The financial context is unfortunate. However, Daiichi’s treatment is regarded as promising and there’s no evidence yet that AstraZeneca has a deal that will destroy shareholder value. It would be worse if CEO Pascal Soriot held back the development of the business just because he couldn’t get the cheapest financing. 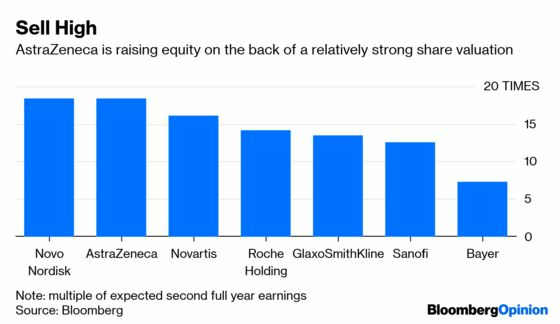 But the transaction is a reminder that while AstraZeneca is among the most highly rated European pharma stocks based on expected earnings, its attractive pipeline isn’t gushing cash just yet.